1. Pile the cabbage, salad onions and chilli into a large bowl, sprinkle with the vinegar and set side. 2. Heat the oil in a small frying pan, then cook the tofu for 4-5 minutes, stirring often, until golden and heated through. Meanwhile, warm the tortillas and the rice in the microwave according to pack instructions. 3. 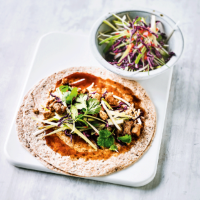 Spread the hoisin over each tortilla, then top with the rice, cabbage salad, tofu and coriander. Wrap carefully – the burritos will be generously filled – then cut in half and eat straight away. Cook’s tip This recipe is easily multiplied to serve more people. Our 512g packs of seeded tortillas contain enough to feed 8.